Salem, Massachusetts, brings to mind images of intolerance and a culture ossified in superstition. That’s not really fair, of course. Even in the late seventeenth century the people of Salem were living during the Enlightenment and they understood enough of science to question the legitimacy of the spectral evidence of the kind that would stand in Washington DC today. With twenty direct deaths due to witchcraft accusations and many more lives disrupted or ruined, this tragic episode has perhaps unfairly cast New Englanders as credulous rubes willing to believe just about anything. If you’re like most of us, you may not be aware that other witch trials were going on around that same time period, but with differing results. Richard Godbeer’s Escaping Salem: The Other Witch Hunt of 1692 recounts the events in Fairfield County, Connecticut in Salem’s haunted year. As in Salem a young woman began experiencing fits. Medical explanations—rudimentary as they were—didn’t explain everything away, so supernatural causation was considered. Witchcraft was suspected. Accusations were made. In the case of Kate Branch of Stamford, as Godbeer shows, Connecticut was learning the lessons of Salem in real time. The belief in witches and witchcraft was just as real, but realizing the bad press their northern neighbors were receiving, the Connecticut Yankees insisted on more stringent evidence. Indeed, judges dismissed the jury to reconsider their decision and even overturned it based on reason. These were people who knew that human lives were at stake. They also knew that Salem was doing nothing to vindicate the cause of either Puritans or justice. We don’t hear about it so much, I suspect, because those in power did the right thing. Given present circumstances, reading about Americans who actually learned from history is encouraging. We read daily of a president woefully unaware (and proudly so) of his own nation’s history. What could possibly go wrong? Witch hunts are sad miscarriages of justice in the best of times. In days when minorities are being scapegoated for the problems capitalism itself causes, we have to wonder if, apart from those in contemporary Connecticut, we’ve learned anything from Salem at all. Wasn’t it clear that targeting women—many of them social outsiders, and pretty much all of them recently descended from immigrants—was in itself just plain wrong? We pride ourselves on having outgrown belief in magic, and yet we go into that voting booth without a rational reason to elect a self-evident bigot and abuser of women and do it anyway. Reading, knowing where we’ve come from, prevents all kinds of tragedies. And this isn’t alternative factual history. It happened in the very shadow of the calamity of Salem, Massachusetts. Albinism occurs across species. In human beings, suspicious and superstitious lot that we are, it’s sometimes an excuse for prejudice. I’ve confessed in the past to reading Weird N.J. (Long story.) When we first moved to the Garden State a series of stories ran about rumors of albinos in a secret town, probably deep in the woods. Don’t scoff—there are deep woods in Jersey! Typical of stories in the zine, people—mostly of the teen variety, I suspect—would write of driving around late at night, discovering these albino enclaves, and being chased out by people lacking pigment and tolerance for strangers. Average juvenile behavior. I had no idea at the time that people with albinism are actually seriously mistreated. This is particularly a concern in Malawi. A story in the Washington Post by Max Bearak describes how albinos are murdered for body parts because of a rumor that, among other fabrications, they have gold in their bones. As someone who has a love of folklore (and it’s more puerile kin—thus Weird N.J.) this is deeply disturbing. Folklore often focuses on the strange, unusual, or uncanny. Let’s face it, there’s not much of a story to tell when everything’s normal. Humans have the natural predisposition to tell tales when something is out of the ordinary. Our saving grace is that we recognize stories are just stories. When we start taking fiction for fact, we’re all in trouble. Many the night before Snopes I cowered under the covers because of some urban legend spreading by however ideas spread before the internet. There were killers on the road at night, and hiding under your car in the parking lot. At the same time, I could separate truth from the stories my step-dad told of jars of buffalo nickels buried in the woods behind our house. Nobody wants to be thought gullible. In the sad case of those who are killed for being different, the Post article cites a United Nations specialist stating, “The situation is a potent mix of poverty, witchcraft beliefs and market forces which push people to do things for profit.” Poverty. Market forces. Profit. A new kind of clarity. Violence comes in many guises. One of the most insidious is that which some specialists call “slow violence.” Systems set up to exploit, drain, and yes, enslave others to one’s own benefit. And it’s perfectly legal. The plight of those born with albinism in a nation where their differences plainly show dolefully demonstrates a side of human nature that we would rather hide. Those who have control of resources place others in situations where they contribute to their personal bottom line. We call it business as usual while those who observe closely call it by another name. Witchcraft. Non-directed reading sometimes follows its own track and a reader might become kind of an accidental expert. I wouldn’t claim that for myself, but I have noticed that scholars, until very recently, tended to give the cold shoulder to anything with a whiff of magic about it. Ancient magic is fair game, of course, but anything like post-Enlightenment magic is anathema, a veritable shibboleth of philistine sensibilities. No scholar worth their diploma would study such a lowbrow topic, let alone give it any credence. Popular culture, and increasingly political culture, tend to ignore academics, however. I have, in my exile from academia, become interested in those who consider themselves witches. I have, I realized recently, read quite a bit about the phenomenon and have been casting about for academic treatments that might fill in some of the gaps. It is a fascinating subject. Ironically, many religion scholars who swear by a mythological worldview of the first century, devalue magic, or Wicca. Many who study it handle it like a peculiar bug, something that might profitably be placed under the microscope as a living curiosity. The thing is, and I realize that academic institutions often shelter their inmates from the real world, many people still do believe in a kind of magic. It may not involve Harry Potter spells and wands, but everyday life outside the academy sometimes defies explanation. Scientists say it’s impossible, and scholars of religion are quick to lock step. Yet the number of those either openly or clandestinely joining occult groups appears to be increasing. Maybe they know something that the experts don’t? While working on my academic paper for the Society of Biblical Literature annual meeting, I have run into the amazing void of interest in contemporary magic. The television series Sleepy Hollow has revived some popular fascination with the topic. The curious, however, have few scholarly resources to consult. Here is perhaps the paradigm that shows most clearly why higher education runs into trouble. Could it be that in the academy the Lowells talk only to Cabots, and the Cabots talk only to God? Have they forgotten how the common folk live? Those of us who grew up common are often not welcome in the academy. Our downmarket ways and simian brows mark us as the sort so gullible as to believe in some kind of magic. But the numbers are on our side. And the only option sometimes is to become your own expert. I have moved from the territory of Sharon to that of Laura. New York City is a conglomeration of smaller neighborhoods, and even Midtown Manhattan hosts hundreds of smaller sub-divisions. Although I’ve never intentionally consulted a psychic, I do tend to notice them. Once while on a visit to Galena, Illinois during the summer, we stumbled on a psychic booth where the proprietor was giving free readings. With some trepidation, we let her give our daughter a reading, just for fun. I don’t recall what she said, or even what her name might have been. There’s just enough fear of the unknown left in me to compel me ever want to visit a psychic, even if it is for entertainment purposes only. Clearly, however, there is a market. Where the market makes a hole someone will fill it. 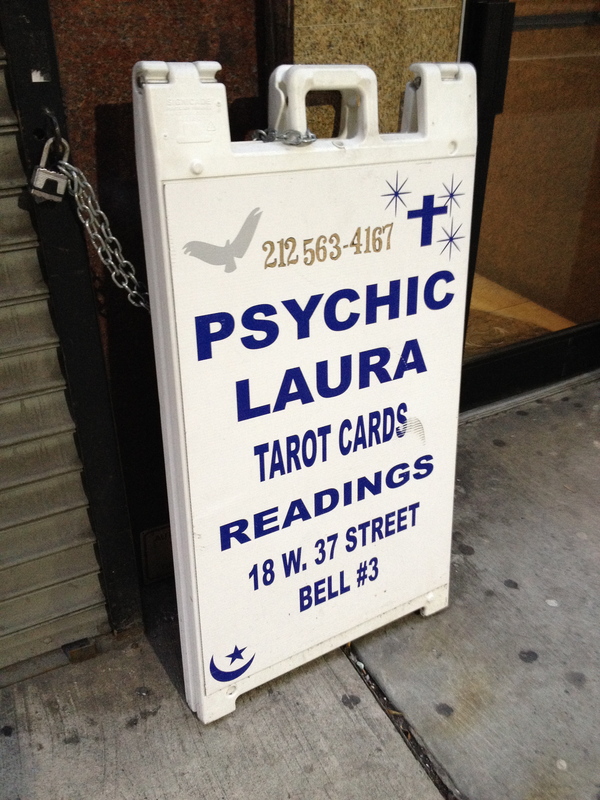 So I pondered Laura the psychic. The other day I passed her sign. Like most psychic ads I see, Laura’s sign makes use of religious symbols; the cross, bird, crescent and star, all thrown together amid an interfaith openness from which most religions might learn a lesson. Are psychics religious? I suppose that’s a personal question. The phenomenon of psi, if it does exist, and if it does involve spooky influence at a distance, tends to be classed with the supernatural. A few brave universities have from time to time explored the phenomenon, whether or not commercial psychics have it, scientifically. They set up controlled experiments and have even obtained statistically significant results. I’m more inclined to doubt statistics than the outcomes. Statistics are the tools of markets, and markets, well, make me shiver. Then I passed another sign. 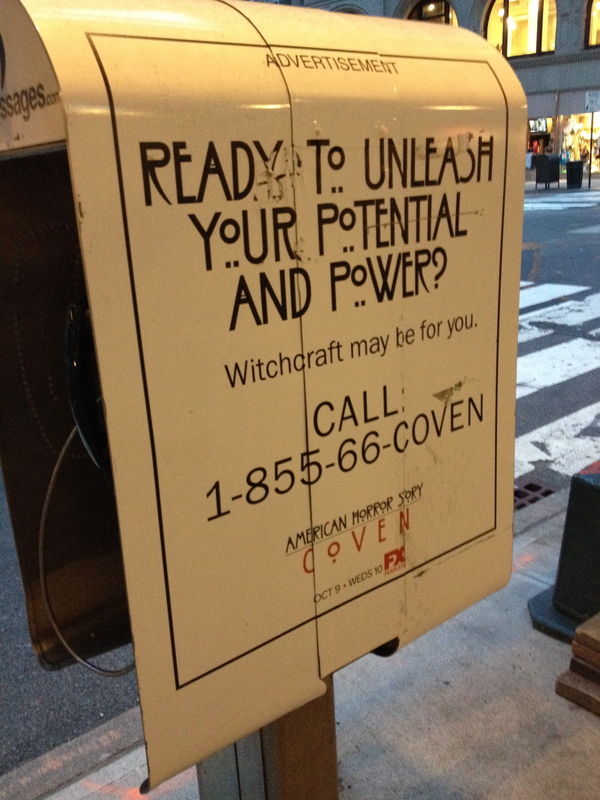 This one, just a block or two from Laura, seemed to suggest that witchcraft might unleash my potential and power. That sounds like a good thing. But then I noticed the FOX logo at the bottom. Another quality program, it seems, has fallen to the spell of witchcraft. It did confirm, however, that it is all about money. One size does not fit all. Religion adapts to fit a free market economy. Totalitarian states either attempt to disband religion completely and/or build up a national mythology that supplements traditional teachings. It doesn’t take a psychic to see that coming. As long as there’s money to be made, who’s complaining? With all the buzz about the new Carrie movie just released, I decided to go back and watch the Brian De Palma version again. I’ve written here before about the religious symbolism of the movie, but I have to confess to never having read the novel. This time a particular symbol stood out, and I’m not sure whether it derives from De Palma or King. 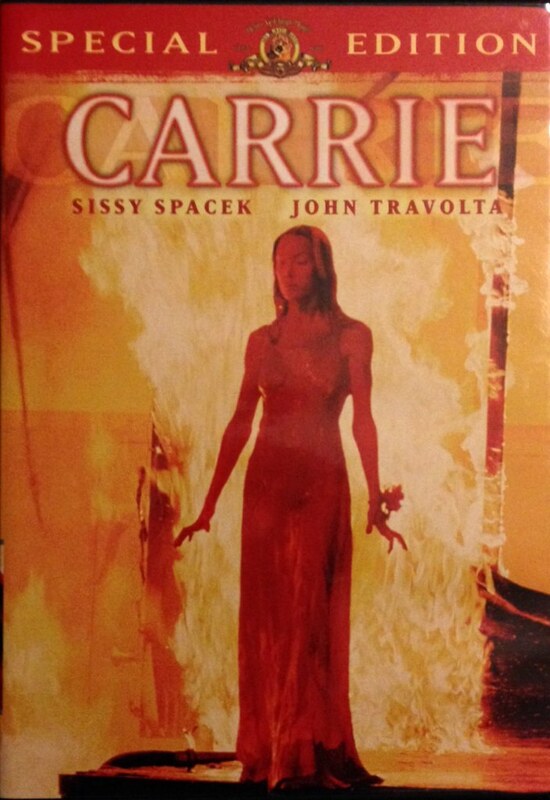 Crosses abound in the 1976 Carrie. This is a bit odd because of the indeterminate religion of Carrie’s mother. Clearly she has a belief in Jesus, but an odd Jesus it is. In Carrie’s prayer closet the statue—presumably of Jesus, since it is never clearly identified otherwise—is of a man whose abdomen in pierced with arrows. Those familiar with saints immediately recognize Saint Sebastian, but the arms are outstretched, as if this poor victim were both crucified and superfluously shot with arrows. The traditional cross, however, seems to be missing in that dark room. It reappears on prom night. While Carrie is getting ready for the prom, her crazed mother peers out the window at passing cars, telling Carrie that Tommy isn’t coming. In one shot, as two cars pass in the street, there appears an inverted white cross on the road. I supposed at first that this was a painted parking space marker, but then, this is a residential street, and no such markers appear in other shots. Carrie’s mother had accused her of being a witch, and the upside-down cross is an oft-claimed symbol of Satanism (not the same, however, as Wicca). At the prom, Tommy insists that Carrie vote for them as the prom queen and king. When Carrie makes her x, the camera angle rotates slightly to reveal the sign as a Latin, as opposed to Saint Andrew’s cross. After Carrie kills everyone and goes home, her mother stabs her and, chasing her through the kitchen, makes the sign of the cross with her knife. Finally, Sue—in a dream?—wanders to Carrie’s burnt down house to lay flowers at the foot of a “for sale” sign that is a white cross, with the clashing words “Carrie White Burns in Hell” scrawled on it. I may have missed more since the use of the symbol only dawned when the passing cars pointed me toward it. There is a strange kind of misuse of the cross here—not visible on the Sebastian-Jesus, and ultimately also Carrie’s mother figures, but inverted on the street, a sign of pride at the voting, made with a knife by the mother, and scrawled with an arrow pointing to Hell in the final scene. Carrie’s fiery end appears to confirm her mother’s interpretation of telekinesis as witchcraft. There is no forgiveness in this film. Well, I suppose I’ll have to go see the remake now. And maybe even read the book. I need to know if I’m just seeing things or if I’m still sleep-deprived from worrying about jobs and a surfeit of imagination as October’s chill settles in. Upon occasion I found movie clips to be of great help in explaining ideas in religion classes. 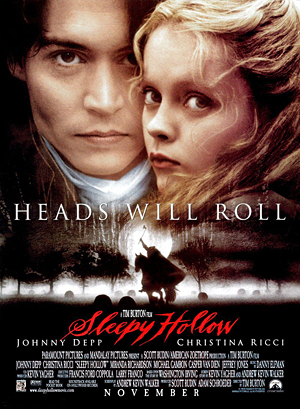 A movie whose clips I used sparingly, due to concerns for squeamishness, was Sleepy Hollow (the Tim Burton movie, not the modern television series). Upon viewing it again recently, I was impressed by just how much religion is intertwined in the narrative. This is especially interesting since Washington Irving’s story does not contain much in the way of religious symbolism or motifs. From the beginning of the film, Rev. Steenwyck is one of the conspirators, making the church complicit in the attempt to subvert the van Garrett will. When Ichabod Crane arrives in Sleepy Hollow the cleric drops a Bible—a recurring motif in the movie—on the table beside him, telling Ichabod it is the only book he will need. 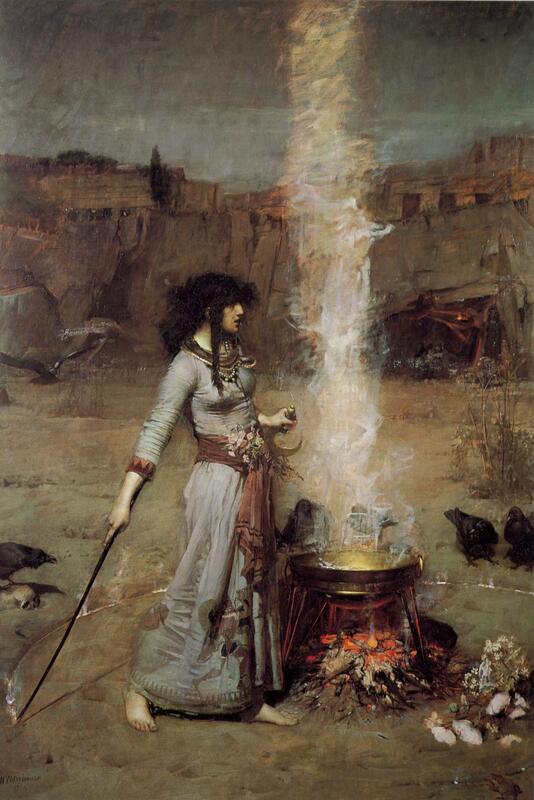 Christianity and Paganism clash throughout the film as a number of the women are revealed to be witches, either “innocents” or practitioners of a darker kind of magic. In flashbacks Ichabod Crane recalls his mother’s white magic that draws the ire of his ordained father. Indeed, Ichabod’s father is a stylized amalgamation of Roman Catholicism and Protestantism blended into one. His harsh white chapel houses an inquisitorial torture chamber in which he murders his wife. Seeing her pagan symbols in the fireplace ash, he too drops a heavy Bible to point out his wife’s sins. When he stalks off from his medieval chamber of horrors, the camera angle shows him to be headless—he is the true terror, rather than the Horseman who was raised by magic and appeased by the simple return of stolen property—his head. Even in the present Rev. Steenwyck is both an adulterer and a murderer. The melee in the church leaves the final three conspirators dead. The white witches, however, are marked by their purity. Mother Crane is so light that she can float up into the air. Katrina van Tassel draws chalk icons to protect Ichabod, indeed, the whole town, from evil. While Ichabod refers to his father with the evocative phrase “Bible-black tyrant,” his mother was an innocent child of nature. In the film Ichabod moves from the rational view of life to one that allows for the supernatural, in the form of magic. True, the Horseman cannot cross onto the consecrated ground of the church (another Catholic concept mixed in with the Protestant milieu), but the faith that saves Ichabod’s life is the book of spells given to him by Katrina. Yes, the physical book stopped a material bullet, but it was faith the put the book in the pocket in the first place. All very appropriate to bring students’ minds to religion in the autumn of the year.